It’s a bit disconcerting to be introduced as a speaker to a group of genetic genealogists with an explanation that the reason why they don’t allow canned soda in the lecture hall is so that nobody can throw the cans at the speaker. Ah, yes, such is the life of The Legal Genealogist, trying to convince a room full of people who live, breathe and sleep DNA tests for genealogy that maybe, just maybe, some types of regulation related to DNA testing might not be such a bad idea. And I’m most grateful to Family Tree DNA for inviting me to speak on the topic Regulating Genetic Genealogy: Does It Make Sense? 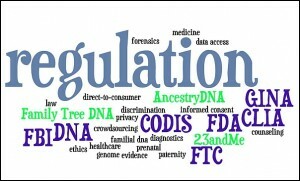 and for being open-minded enough to recognize that there are some ethical and legal questions we’re all going to have to think about and address as we move further and further into the great unknown of genetic genealogy. And that maybe, just maybe, some types of regulation — reining in the charlatans of the industry, requiring legally and ethically sound decisions on informed consent, and protecting us all from discrimination and stigmatization based on genetic data — really might not be a bad idea at all. The venue for this 8th annual two-day conference for DNA project administrators and others interested in genetic genealogy is Houston, Texas. The 190 or so attendees are a mixed group ranging from those with “just” an interest in genetic genealogy to those who could teach genetics at the graduate school level. As a speaker, I also get to sit in on the sessions and that too is a blast. Dr. Spencer Wells, head of the National Geographic Society’s Genographic Project, was the keynote speaker, addressing the conference via Skype from Florence, Italy. We’re within just weeks — maybe just a couple of weeks — of the first results rolling in on the Geno 2.0 project, which is being conducted in conjunction with the Family Tree DNA lab, and the results promise to be mind-boggling in their detail. Remember, Geno 2.0 is mostly deep ancestry and genetic anthropology, rather than genealogy, but oh my… are we ever gonna have fun when those results are available. One of the things Geno 2.0 promises to do is really refine what are called admixture results — the percentages of your DNA that can be said to have come from the different geographic areas where your ancestors lived. I’ve tested with all three of the big DNA testing companies. 23andMe reports that I’m (yawn) 100% European. Family Tree DNA reports that I’m (yawn) 100% European, mostly — 85.86% — from western Europe. AncestryDNA reports that I’m 43% Central European and 7% Finnish/Volga-Ural, which probably represents my German-born father, and 35% British Isles and 15% Scandinavian, which may represent my mother’s side if we assume the Scandinavian comes from Vikings who raided in Britain. Now compare that to one admixture report we were treated to today, of a Muslim cleric living in Italy, whose results showed 59% Mediterranean, 25% South Asian, 7% Northern European and 6% sub-Saharan African, resulting in an overall call that his ancestry was likely from Kuwait or Lebanon. Get that. Not from the Mediterranean region. Not from the Middle East. But from Kuwait or Lebanon, with Kuwait more likely. That level of detail is going to be game-changing. There are 43 populations included right now, and more will be added on a regular basis. And for those with that story about the Cherokee Princess in your ancestry? The test isn’t going to show a Cherokee Princess (there weren’t any), but if you have a single Native American in your line in the last six generations — back to your 4th great grandparents — it should be able to detect it. Other sessions — besides mine on regulation — focused on specific types of DNA testing, on identifying locations for surnames in Ireland using DNA data (check out http://www.irishorigenes.com/ and companion websites for England and Scotland), and on general questions about testing with Family Tree DNA. Today promises some repeats (some individual sessions were jammed and most people wanted to attend more than one) and some case studies, as well as presentations specifically on mtDNA and YDNA testing. I agree completely, Judy. A female member of my extended family tested (FTDNA) as roughly 50% Maya/Pima (which is probably her mother), 30% Russian, and 20% Mozabite (Berber), the last two likely from her father, who however has not been seen the last 20 years. OK, so when the French invaded Mexico, they had Berber troops, but where did the Russian come from? Those Berber troops fought in the Crimean War ten years before they went to Mexico, but what are the odds? This is going to be interesting!!! Wow, John, that is really wonderful! What a great interesting question for you to answer! Something that can help some of us narrow down our Irish lines would be amazing. Having the surname Jordan from possibly Cork, Loftus from maybe Sligo, McMahon from somewhere in Clare, Potter from Ireland (to name a few) – I am riddled with Irish from unknown locations. I would be thrilled for more details in location from DNA. The tool we saw demonstrated helps correlate DNA results and surnames mostly by focusing on surname locations and where they overlap, Patricia. It’s obviously not perfect but may well offer some hints. Fascinating! When you say, “The level of detail is going to be game-changing,” I’m betting you meant that the complications will be beyond belief! But I’m wondering if you also might mean that recognizing each of our admixtures will help racial barriers and stereotypes finally to dissolve? That seems to be Henry Louis Gates’s point in “Finding Our Roots.” I certainly hope that these levels of detail will easily overwhelm our “purist” preconceptions about white folks vs. people of color. I’m looking forward to learning more! Thanks for the post. I suspect it’ll be game-changing in a lot of ways, Mariann. One should be the “we really are all honest-to-goodness cousins so knock off the bias” stuff. And one should be getting a look at things we never really thought we would get a look at before strictly through DNA. Thank you for your presentation to the FTDNA conference. I especially appreciated your cautions about disclosures and other “informed consent” statements to prospective project members. As a project admin, I believe it’s only fair to let people know the rules of the game before they choose to play. Thanks for the kind words, Ralph. I’m glad you found the presentation helpful.